On the Menu…Live! » Food-n-Booze on A Morning Affair! Food-n-Booze on A Morning Affair! Today I launched a new series on KVOI’s weekday show, “A Morning Affair with Mark Bishop,” that covers our local culinary and cocktail scene. Pour yourself a cocktail and listen to our conversation! 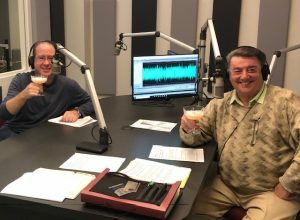 The half-hour segment is called Food-n-Booze, and I’ll join Mark on his show on the last Friday of every month for a look at things making news on the food and beverage beat. In this inaugural appearance, I shook up some cocktails while introducing Mark’s audience to the Grand Canyon Distillery. « Tales of the Keg on ESPN Tucson: Barrio Brewing Co.